Introducing UK melodic rock vocalist Steve Overland is like reinventing the wheel; it's just not necessary, but always well said. From his early beginnings with Wildfire to the legendary melodic rock band FM to his own projects and partnerships The Ladder, Shadowman, and Overland, Steve Overland's vocal performance and accomplishments are well-known. His second album, Diamond Dealer, for his current solo project displays Overland at his best in his most favorable environment. Mr. Overland turned some heads with 2008's Break Away as some saw this as a major departure from his FM roots. I think the verdict is still out on that. But FM/Overland fans may find Diamond Dealer more akin to the FM sort of AOR/melodic rock they've grown to love. You'll find some edginess here and there on this disc. But mostly Diamond Dealer is Overland's more passionate and soulful vocal style over well-tempered rock arrangements blessed with tons of melody and huge vocal arrangements. Train, Train, City of Dreams, Hearts Don't Lie, and Coming Home are only a few selections which find Steve using his profound vocal skills to bend emotional and musical heartstrings. 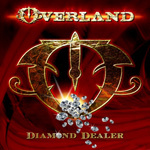 Diamond Dealer is nothing but expected and solid work from master melodic rock vocalist Steve Overland. Fans should scoop this one up. Diamond Dealer is nothing but expected and solid work from master melodic rock vocalist Steve Overland. Fans should scoop this one up.